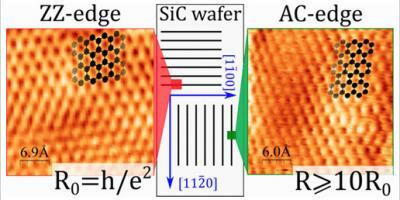 Researchers have fully characterized graphene nanoribbons (GNRs) with a clear route towards upscaling the production. Two-dimensional sheets of graphene in the form of ribbons a few tens of nanometers across have unique properties that are highly interesting for use in future electronics. The nanoribbons were grown on a template made of silicon carbide under well controlled conditions and thoroughly characterized by a research team from MAX IV Laboratory, Techniche Universität Chemnitz, Leibniz Universität Hannover, and Linköping University. The template has ridges running in two different crystallographic directions to let both the armchair and zig-zag varieties of graphene nanoribbons form. The result is a predictable growth of high-quality graphene nanoribbons which have a homogeneity over a millimeter scale and a well-controlled edge structure. An international research team, co-led by researchers at the University of California, Riverside, which also included researchers at MIT, Nanyang Technological University, Singapore; Institute of High Performance Computing, Singapore; UC Berkeley; and National Institute for Materials Science, Japan, has found a new mechanism for highly-efficient charge and energy flow in graphene, opening the door to new types of light-harvesting devices. The researchers made pristine graphene into different geometric shapes, connecting narrow ribbons and crosses to wide open rectangular regions. They found that when light illuminated constricted areas, such as the region where a narrow ribbon connected two wide regions, a large light-induced current, or photocurrent, was detected. Researchers from the University of California, Santa Barbara, will be presenting a paper focused on CMOS-compatible graphene interconnects next month at the world-renowned semiconductor-technology conference - the IEEE International Electron Devices Meeting (Dec. 1-5 in San Francisco). The team has shown that integrating graphene into the interconnect scheme holds the promise of increasing performance and limiting power consumption in next-generation CMOS ICs, as graphene offers high conductivity and is not prone to electromigration. Researchers at EMPA (Swiss Federal Laboratories for Materials Science and Technology), along with colleagues from the Max Planck Institute for Polymer Research in Mainz and other partners, have succeeded in precisely controlling the properties of graphene nano-ribbons (GNRs) by specifically varying their shape. This can be used to generate specific local quantum states, and could in the future be used for precise nano-transistors or possibly even quantum computing. 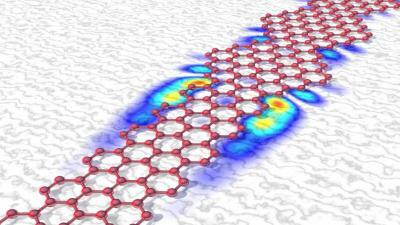 The team has shown that if the width of a narrow graphene nano-ribbon changes, in this case from seven to nine atoms, a special zone is created at the transition: because the electronic properties of the two areas differ in a special, topological way, a "protected" and thus very robust new quantum state is created in the transition zone. This local electronic quantum state can be used as a basic component to produce tailor-made semiconductors, metals or insulators - and perhaps even as a component in quantum computers. 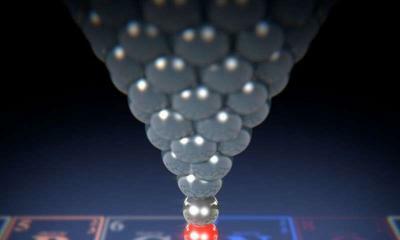 A team of researchers from the University of Basel, the National Institute for Material Science in Tsukuba in Japan, Kanazawa University, Kwansei Gakuin University in Japan and Aalto University in Finland has succeeded in using atomic force microscopy to obtain images of individual impurity atoms in graphene ribbons. Thanks to the forces measured in the graphene's two-dimensional carbon lattice, they were able to identify boron and nitrogen for the first time. The team replaced particular carbon atoms in the hexagonal lattice with boron and nitrogen atoms using surface chemistry, by placing suitable organic precursor compounds on a gold surface. Under heat exposure up to 400°C, tiny graphene ribbons formed on the gold surface from the precursors, including impurity atoms at specific sites.